How do you go about finding new books? The answers to #1 vary widely, but the answers to the second (more compelling) question are usually not surprising. Most readers hear about books via word-of-mouth or author name recognition. This both understandable and frustrating for up-and-coming authors: neither channel is truly within their control. The only other answer I’ve heard to question #2 came from my cousin’s wife, who told me that she mostly reads free Kindle books recommended to her by Bookbub. Bookbub is a Boston, MA startup that provides digital book recommendations to >5 million subscribers. Every day, their editorial team sifts through hundreds of free and low-priced e-books to recommend the best choices in a variety of categories. These are customized to meet each subscriber’s preferences, such as genre, location, and format. According to an article in the Boston Herald, about 20% of subscribers click on a deal every day. 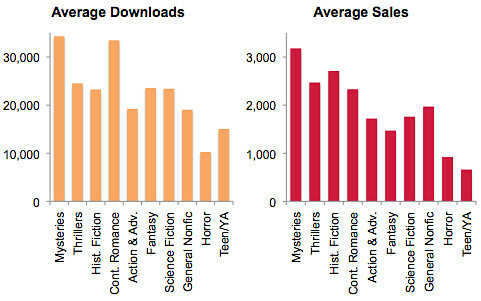 Bookbub drove 10 million e-book sales last year, and they continue to grow. For readers, the service is wonderfully easy to join. You sign up with your e-mail address, click a few of your favorite genres (or authors), and you’re all set. You submit a listing, which requires some basic information about the author, the book, and the deal you’re offering. You must offer your e-book for free or heavily discounted (>50% off) and for a limited period. Bookbub reviews the submission. If it meets the minimum requirements, it goes to their editorial team. If your submission is chosen, you get an invoice and go to step 3. The author or publisher (not Bookbub) pays the bill, and coordinates these discounts with retailers. 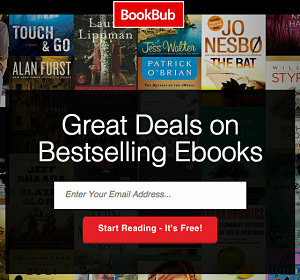 Bookbub’s team prepares the promotional e-mail, including the blurb, target list, and cover image. (If you don’t have a professionally designed book cover, you never got to step 3). The e-mail goes out on a pre-determined date. Hopefully, lots of downloads/purchases follow. What excites me about the service, and most of the motivation for this post, is that Bookbub provides some hard numbers on their pricing page. You know I loves me some data. Let’s break it down. Disclaimer: This is only a snapshot based on Bookbub’s historical data taken January 2015. I have no relationship with Bookbub. Please consider them the ultimate source for this information. 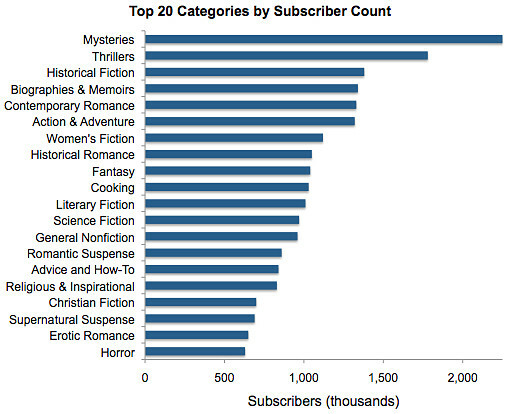 You can see that mystery readers dominate, numbering 2.3 million. Thrillers come next, followed by historical fiction. The fourth most popular category is a nonfiction one: biographies and memoirs. How Much Does Bookbub Cost? The first thing many authors and publishers will want to know is how much the Bookbub service costs. It would be unfair for a mystery author — whose promotion goes out to 2.3 million subscribers — to pay the same as a horror author promoted to 630,000. 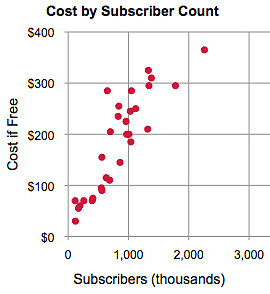 Indeed, the cost of the service is a one-time fee that’s roughly correlated to the number of subscribers for a category (see the scatterplot). 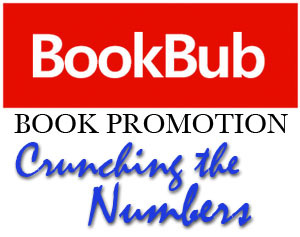 The Bookbub service cost is also determined by the promotional price you’re offering. You get the lowest price if you offer the book for free. Right now, the cost of a Bookbub promotion ranges from $30 (free e-book to smallest category) to $1,925 (mystery priced $2+). It would take me too long to break down everything for the ~30 book categories, so I decided to focus on the ones most likely to interest my blog readership, which comprises mostly genre fiction authors. In this analysis, I evaluated ten different categories. The chart to the right and all that follow are ordered by the subscriber counts, in descending order, from mystery (2.3 million) to teen/YA (560,000). Just for kicks, I threw in general non-fiction, which was one of the most popular nonfiction categories. The service costs here are more representative of Bookbub as a whole. For a free e-book, they ranged from $90 to $365 (see the histogram). For a non-free book (priced <$1), it’s $180-730. Even more for books priced over a dollar. Obviously Bookbub is strongly encouraging its partners (authors & publishers) to price their books as cheaply as possible. Maybe it sounds counter-intuitive to pay for a promotion that sells your e-book for free. But remember the two most common answers to “how do you find new books?” Author name recognition, and word of mouth. Giving away a free book is one way to get there. This is a tried-and-true practice for authors trying to stand out in an ever-increasing flood of published e-books. Just ask any successful indie author. There are several interesting patterns to note here. First, look at the scales on the Y-axes. 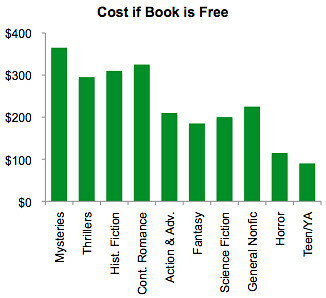 The conversion rate for free e-books is ten times higher than it is for discounted-but-paid e-books. In both types of promotion, we see that mystery books yield the most conversions. 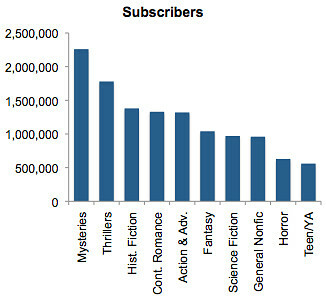 Remember, though, that mystery has the most subscribers (and costs the most). 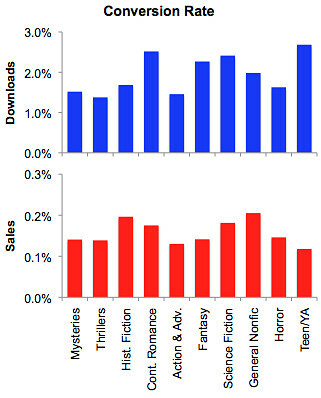 Nonfiction and historical fiction were middle of the pack for downloads, but ranked 1 and 2 in paid conversion rates. Let’s get down to brass tacks. Bookbub is a service that helps find new readers for your book. The subscriber counts, conversion rates, and service costs vary by category, but we can capture all of them in a single metric: the cost per new reader. This is the cost of the service divided by the average number of conversions (downloads or sales). It’s about 11-15 cents per new reader of free e-books, and 23-28 cents per new paid reader. Highest cost per new reader? Contemporary romance, for both free and paid. Let’s play this out in a scenario: You have a mystery selling at $1.99 or more (regular price). You get in to Bookbub and offer a promotion price at $0.99. You pay $730 up front, but sell 3,180 e-books. Your royalty from Amazon is $0.35 per book, so you make $1,113 for a profit of $383. That seems like a good investment to me. Remember, this is the average performance. 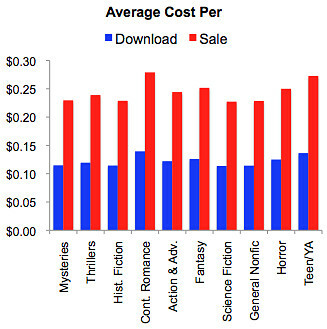 The range on paid sales for mystery, historically, has been anywhere from 500 to 8,000 books. Either way, however, you stand a reasonable chance to move some books. To garner new reviews (hopefully) and perhaps some word-of-mouth. I joined Bookbub as a reader in early January to try it out (and because I knew I’d probably be writing this article). I signed up for recommendations in two genres — you can guess which — and thus far the service has been delightful. 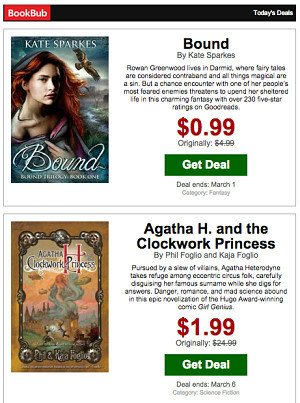 I get a daily e-mail with 2 “deals” including a blurb, cover, and the discounted price (usually free, $1, or $2). I like the “set it and forget it” appeal. I don’t have to follow RSS feeds or read long newsletter-style e-mails. The e-mails themselves are unobtrusive. I don’t mind glancing at them, both to keep an eye on the market, and because they’ve been pre-vetted by Bookbub’s editorial team. I also know the author’s put up some serious dough to get the word out. In other words, the opposite of my Twitter feed. Bookbub seems to fill the vacuum left by the closure of so many brick-and-mortar bookstores, as a source for recommendations. For authors and publishers hoping to promote books, this is one to watch. Thanks for this great breakdown, Dan! I’m bookmarking it. An excellent and insightful guide- we owe you a debt for all the research. After reading my head is spinning back to doing a .99 discount and racking up some readers. Bookbub also does the paid ads, but that feels like more of a “round two” proposition. Thanks again. Great work – any chance you update this article to 2017/18?